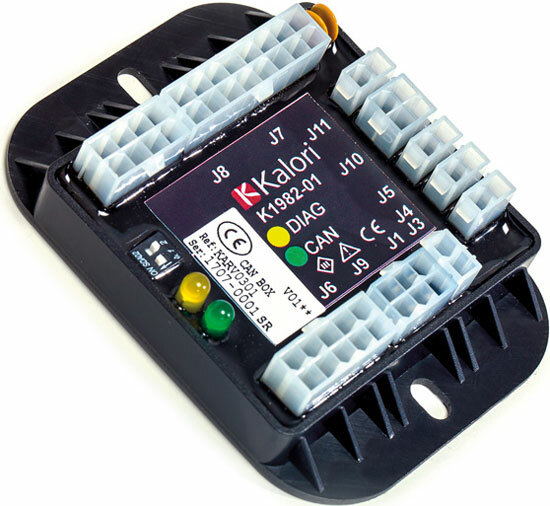 Kalori’s (Germany) air-conditioning (AC) equipment can be controlled by a CAN-based communication system. The Kanbox supports CANopen and J1939. The Kanbox enables vehicle constructors to manage all controls associated with heating or air conditioning operation. These controls can be activated via the vehicle’s own interface, meaning the manufacturer can save the costs for an additional panel. It can also be controlled by certain modules like the PCK3. The Kanbox can control the compressor, condenser, pressurization, and up to four actuators. The product also communicates with temperature sensors and other devices. It is surge-protected and polarity-reversal protected, operating from 9 V up to 36 V. The device comes in an IP66-rated housing featuring “minifit” connectors. It also respects Reach (1907/2006) and Rohs requirements (2011/65/EU). The optional CAN interface features CANopen and J1939 compatibility. The company said, the investment is offset by the savings made on the overall cost of controls and this technology also enables further information management (e.g. diagnostics, connection status etc. ).